With a new type of server the question must be asked what is the aim and how do I achieve it. 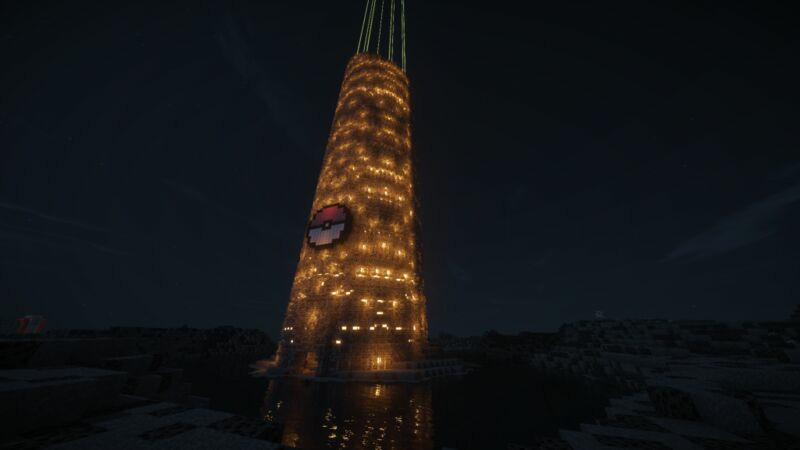 Well by combining two of the most popular parts of minecraft we have the objectives of a prison server with the added awesomeness that is pokémon. The aim is to escape the prison and venture outside where the land is plentiful, pokémon roam around, however to reach this beautiful survival you must rank up to a free player. To rank you will need to mine resources and sell them to get money. Then spend your money to get time in the safari zone. In the safari zone you can catch and battle pokémon to level up your pokémon and build up your Pokédex. When you feel ready you must pay for a gym battle. When you have beaten a gym you will be awarded with a gym badge that you trade in for your rank up and on you go. There is 12 ranks A-L and 6 donator ranks. Each rank will give you acess to all the previous areas and a new area better then the ones before with more high levels and rare pokémon in the safari zones, better pokeball shops, better mines to get resources but of course more expensive and difficult gym battles. Please note that the donator ranks give gym badges for extra perks not rank-ups. Enjoy! It is important for everyone to know and understand how things work and are organised. Over your time playing here you will come into contact with terms like Blocks, groups, gyms, safari zones and more, so here I will explain what all of them are. Blocks – A block is the area of the prison that that ranks mines, cells, portals and more is located. For example A block is that area that the two A mines, the 44 player cells, Brock portal and more can be found. Its more or less everything past the arch with A above it. The highest block you can enter is your rank but this is not to be confused with each other because you can go mining in any block lower then your rank. Your rank simply gives you access to that ranks block. For example getting rank B gives you access to B block but you can also still enter A block as before. Groups – A group is a collection or group of blocks. There are 4 groups, A-D housing the A, B, C and D blocks, E-H with E, F, G and H blocks I-l and the donator group 1-6. Each group has its own style of player cells and as you gain access to higher groups the player cells in all the blocks in that group will be nicer. Each group also has its own safari zone and a price for 15 minutes access to that safari zone. Safari zones – Safari zones are where you can find wild pokémon and trainers. Here you can find a pokecenter to heal your pokémon and store them at your will and you also will find a mart to buy your pokeballs, potions and other stuff. Each group has its own safari zone with a price attached to it. As you get to higher ranked safari zones they are larger in size, more diverse landscapes with different biomes and have higher level pokémon at rarities very similar to the games with pokémon spawning in their natural habitat. You can’t walk out, fly out or otherwise escape from safari zones. Very nice server because the admin is very friendly an the peoples too. When i heard the concept of a pixelmon rison i thought it was jst a prison trying to advertise but when i logged on they proved me wrong it is an amazing experince to battle/hunt and mine to challenge the gym leader. Friendly community with helpful staff but last but not least the concept is just interesting over all as a mixture of both pixelmon and prisons which sets off players to try out things that you normally can't do in survival/adventure pixelmon servers. Overall it's an awesome server which would most likely be one of the best servers I've been to. A perfect combination of the highly popular Prison gamemode and the Pixelmon mod. Great community, always someone there to help you, updated often. ^_^ You won't regret joining. Truly one of the most unique and awesome servers i ever played in. Great community, friendly staff and a overall fun experience. The way it merges a normal Prison server and Pixelmon is a awesome idea. Reliable server that is almost always up, staff that care, unique idea. Pixelmon prison forces you to face off each gym, gradually building up your team by training in the safari and finally allowing you to beat the elite four. Doing so allows you to go to the free world and build and enjoy. Additionally, server also provides custom events created by the owner of the server. The battle tower is a challenge that you can take on with your best pokemon team, defeating each trainer on each floor with no healing until you reach the top and become legendary.